Sclerotia Atlantis are also known as truffles or Philosopher's Stones. One of the biggest differences with other mushrooms is the ability of the Psilocybe atlantis to form sclerotia beneath the mushroom. This is the part that contains very high concentrations of psilocybin. These Atlantis truffles are a bit larger than those produced by other mushrooms, but the effects are the same. All species of psilocybin-containing truffles and mushrooms produce similar effects, depending on the environment and the people you are with, and of course the dosage. Packed per 15 gramm. After ten minutes to one hour you will start to notice the first effects, seeing and hearing things better and more intensely. The Atlantis truffle eater notices a rapid change in the perception of ordinary reality. This often comes down to a good series of laughs. This cheerful start soon transcends into confused feelings. This is due to reality looking so different, your mind just cannot grasp it anymore. As the outer confusion intensifies, the inner visions (best seen in a dark room) become clearer. The trip takes about 6 hours and wears down gradually. The interval between hallucinations gets longer, until they disappear completely. The active substance in the Atlantis Philosopher's stones is psilocybine, a tryptamine that is chemically similar to the human neurotransmitter DMT (dimethyltryptamine). DMT is one of the strongest visionary psychedelics, which occurs abundantly in nature (trees, grasses etc.) and is easily broken down by the body's MAO enzymes, leaving no toxic byproducts behind. 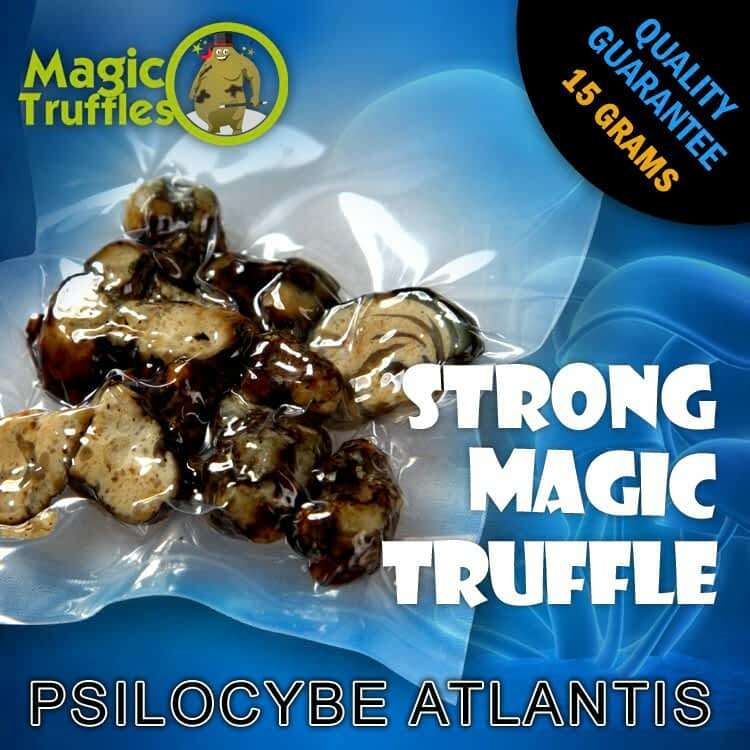 Although the body can handle psilocybine quite well, the mind can get quite confused, which is why Atlantis truffles must be taken in a safe, familiar environment, preferably with a sober sitter nearby. These are fresh atlantis truffles and must be kept in the refrigerator. Take 5 to 9 grams for a normal trip and 10 to 15 grams for a strong trip. Please note: it is possible that during the shipping process the stones dry a little bit. This decreases their weight. But don't worry: the remaining truffles are just as strong as the dosage mentioned above. The most common and efficient way to use atlantis truffles is to eat them raw, on an empty stomach. But this doesn't taste that well, and sometimes leaves a heavy feeling in the stomach, which can be a disturbing sensation while tripping. Although psilocybine is sensitive to heating, it's possible to make atlantis truffle tea, which is more tasty and easy to digest than fresh or dried atlantis truffles. Boil some water, turn the heat down and add the (shredded) truffles. Let them boil softly for about 20 minutes. You can then add a little honey or sugar and drink the tea. Another method is to simply poor some very hot water on the atlantis truffles, let it soak for about 10 minutes, and then repeat the procedure with new hot water. Purchased 3 portions, me and a few friends split 2 portions and had lots of visual effects. According to the guide one should start with 5 grams to gauge sensibility; 2 of us ate 5, 1 of us 6, and the other 12. Love these truffles. Thumbs up! I've done tampanensis and pajaritos before this but these were the best visuals I've had so far. Walked around town with my friend who was sober who was sort of like a storyteller for me, everyone had warped bodies, funny faces and eyes all over their face. Music was good as always, maybe not as much of a euphoric feeling as dynamite, but maybe that was due to setting. They also only lasted 4 hours which was a shame, but I am quite tolerable. Thank you for the fast delivery. Your my number 1 shop for growkits and magic truffles. Till next time!